It gives me great joy to reflect on the blessings, developments and activities here at Masigcine. We have built up a good working relationship with an organization called ARISE who promote a hosting program (www.arisecapetown.org.za). Hosting involves taking a child currently staying in a children’s home into their family for weekends or school holidays. This program offers children the chance to enjoy a holiday and experience family life. Together we were able to find great families for ALL our children. These families had all been screened and had visited us a number of times prior to the Christmas week holidays to ensure that our children were comfortable with the arrangement. Well, what a success! The children seemed happy and more confident when they returned and they had even put on weight and looked healthy. Some of the girls even had their nails painted! One little boy has come back to live with us at Masigcine because we found that he was not being cared for properly by his new foster mother. He has settled in well and has expressed that he is happy to be back again. We have three new little girls who have come to us since just before Christmas and they are all doing well. We were in a position to pay our staff a full bonus in December as a result of donations we received from international volunteers and an international sponsor. This was such a blessing! On Christmas Eve we had an afternoon tea party where the ladies each received a large food parcel as their Christmas gift. I think that the closing of the Home for the Christmas week meant a lot to the staff that they too could spend the festive season with their families and loved ones. We look forward to doing this again this coming December. Our children love the morning classes they attend with Mama Vuyelwa in our classroom three times a week. They do art work, sing, play games, tend to the vegetable garden, write, draw and do other structured activities. We realize the importance of our children being integrated in the community and so we have partnered with two centres close to Masigcine where the children can participate in programs and mix with children from the neighbourhood. 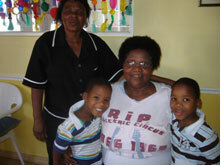 A Xhosa speaking child therapist has also offered his services especially for those children who have been traumatized. Over the Christmas period our children were treated to many parties from companies and individuals. Each party was special and all the gifts and eats we received were so appreciated. Thank you to each and every person who took the time and effort to bless us.